Xbox Video has launched on Windows Phone 8 everywhere Xbox Video is available (Japan not included), so now you can truly take your movies and TV shows with you wherever you go. Stream from the cloud or download your favorite movie or TV episodes to your phone to watch them offline. You can rent or buy the newest hit movies or search for classics from the massive catalog with the first video-on-demand app for Windows Phone 8. You’ll even get Rotten Tomatoes ratings and Metacritic scores right on your phone. Xbox Video on Windows Phone 8 also delivers countless TV shows. With a Season Pass, brand new episodes are automatically added to your collection so you don’t miss a beat from your favorite new shows. Or catch up with every episode from past seasons and relive the glory days of your favorite shows from years past. Xbox Video is a free download in the Windows Phone Store today, and don’t forget to check out the new Web store at XboxVideo.com. Microsoft has also released a new Xbox Music Preview app. This early-access app gives Xbox Music Pass users a look into the new music experience on Windows Phone 8.1 Stream millions of songs from your phone or download the ones you want for offline listening. Create playlists that sync across your devices. Play songs from your personal music collection alongside your Xbox Music Pass content. It’s the best way to experience all the music you love on your Windows Phone. The Xbox Music Preview is available in all 23 markets where Xbox Music is available today. The full release will roll out in 2014. Xbox Music is available today on Windows Phone, Xbox One, Xbox 360, Windows 8/8.1, online at Music.Xbox.com and iOS and Android devices. 1 Xbox Music Pass required to use the app. Compatible devices and internet required. Data charges apply. See Xbox.com/music. 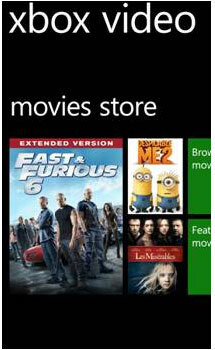 All movies available now on Xbox Video. Fast & Furious 6 and Despicable Me 2 © 2013 Universal Studios. All Rights Reserved. Les Misérables © 2012 Universal Studios. All Rights Reserved. This entry was posted on Thursday, December 19th, 2013 at 8:35 am and is filed under Digital Products, National News, New Releases. You can follow any responses to this entry through the RSS 2.0 feed. You can leave a response, or trackback from your own site.